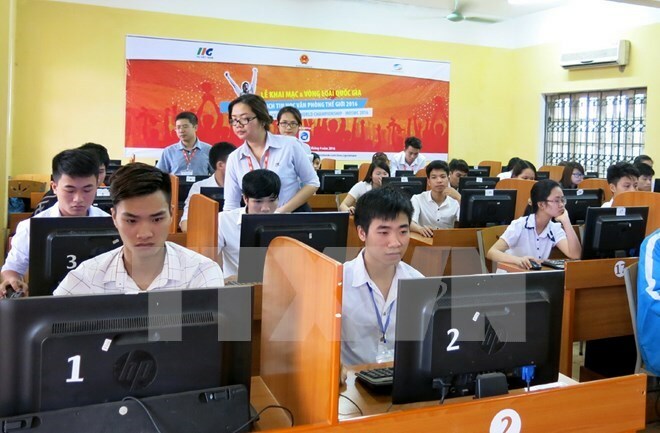 Hanoi (VNA) – Six outstanding Vietnamese students will compete at the final event of the 2016 Certiport Microsoft Office Specialist (MOS) World Championship, the largest global competition that tests students’ skills on Microsolf Office Word, Excel and Powerpoint, in Orlando , the US from August 7-10. They are winners of the MOS National Championship held by the Ministry of Education and Training and IIG Vietnam, who were honored during a ceremony on June 23. The six Vietnamese representatives are Tran Thi Khanh Linh from Ho Chi Minh City Pedagogical University’s high school, Dang Anh Tu from Hanoi Foreign Trade University, Nguyen Hung Minh from Phan Huy Chu high school in Hanoi, Phung Quang Huy from Hanoi Foreign Trade University, Nguyen Thien Vinh from Thu Duc high school in Ho Chi Minh City, and Tran Chi Kien from Hanoi Banking Academy. This is the seventh year that Vietnam has joined the MOS World Championship, which was launched 15 years ago. This year, the national contest saw the competition of 400 schools across the country, a rise of 50 percent compared to the 2015 contest, along with 17 Departments of Education and Training.